To get both Macs hooked up to my Apple Cinema display I went for the Kanex SnapX. 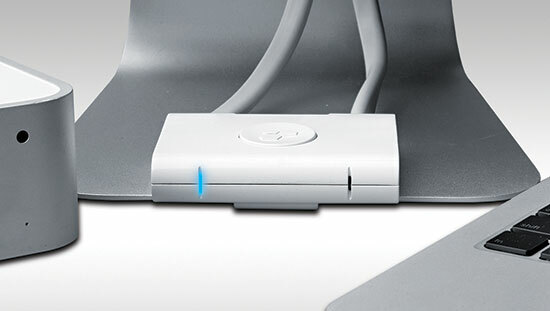 This offers a 2 x Mini DisplayPort and USB splitter with a handy switch right in front of you. The SnapX sends all the usual USB options available for those with Cinema displays so any USB pass through still works including iSight camera, audio and USB ports. The USB ports options are helpful as it means anything plugged into those ports is shared between the 2 Macs. I use one of the Editors Keys wired Pro Tools keyboards so that simply plugs into the back of the Apple Cinema Display. What is also great about the display is that it also offers me a couple of extra USB ports that I can use to plug in things like iLoks and other dongles, see below. If one were to use a wired mouse then it would simply be a case of using on of the USB ports on the back of the Apple Cinema Display or the Editors Keys keyboard. However I prefer a wireless mouse, so Bluetooth is required. However Bluetooth can’t be shared by 2 devices at the same time. The solution I found for this is the Logitech t631 Ultrathin Touch Mouse which has two discreet and switchable channels - so I simply flick a switch depending on which Mac I am using. The Mac Pro runs a Pro Tools HDX rig and the Mac Mini a Pro Tools HD software rig using an Eleven Rack for audio input and then aggregating that and the internal Mac audio so I can get playback. It could be any interface for what’s it’s worth, but for test purposes it works fine. The stereo pair is then routed back through my Command 8 as the External Source… which leads me to another thing. I have a powered 7 way USB2 hub plugged into the rear of my Cinema Display which has a Nektar MIDI controller, the Command 8 and Eleven Rack all plugged in via USB. All work fine using this technique. My iLok and eLicencer dongle are both plugged into shared USB ports. I transferred all my Waves licences onto a USB stick and that is also plugged into a shared USB port. Obviously some plug-ins won’t come across easily such as the UAD and other AAX DSP plug-ins that both depend on the cards in my Mac to function. Any plug-ins that depend on access to large libraries can simply share a drive that contains all the content. I recently purchased Transporter for Mac, a localised Dropbox, one of the advantages being that any files transferred on the same network are shared over the local network rather than having to be uploaded to a Cloud service to be shared, this allows me to share Pro Tools sessions very quickly. I also have Gobbler on both machines. I can also share hard drives if I wish, to do this I purchased a Iogear - 2x4 USB 2.0 USB hub that allows me to connect USB2 drives to 2 machines and then switch between them. It’s always handy to eject any drives before you hit the switch as it makes sure you don’t corrupt any data. Obviously in the real world most people are not going to run two machines from one desk, but in order to have maximum flexibility for testing, reviewing, and of course maintaining the integrity of my working Pro Tools system, this is a winner. For most this set-up will be unnecessary, but I hope these tips help anyone who may need to create a similar set-up.